This cake is a 12 inch graduation cake, it is a chocolate rum cake with cream cheese buttercream filling and filled with strawberry jam and strawberries. 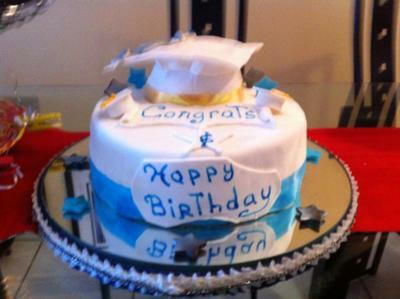 The decoration of the cake is a white graduation cap made out of fondant with gold ribbon, this cake was made for my grandson who was graduating from high school but at the same time it was his birthday. That's why I made two signs, one with happy birthday and the other one congrats this signs were made out of fondant ribbons and also the cake was covered in blue and white fondant. I also made some blue and silver stars and two small graduation caps on side of the signs where it says congrats. Everybody said that it was delicious and very creative! What a fantastic idea! Especially love the graduation cap. Well done. Makes me feel I could graduate...again, just to enjoy it! Beautiful job thanks for sharing it!! !